Percussionist, conductor, and author Steven Schick was born in Iowa and raised in a farming family. 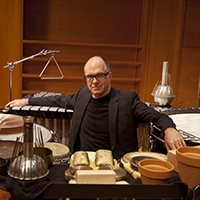 Hailed by Alex Ross in the New Yorker as, “one of our supreme living virtuosos, not just of percussion but of any instrument,” he has championed contemporary percussion music by commissioning or premiering more than one hundred-fifty new works. The most important of these have become core repertory for solo percussion. 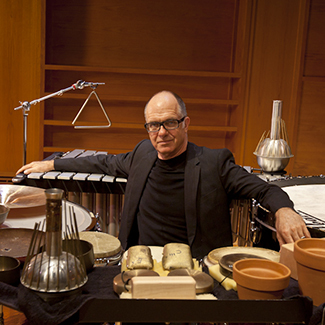 Schick was inducted into the Percussive Arts Society Hall of Fame in 2014. He was also music director of the 2015 Ojai Music Festival. Steven Schick is artistic director of the La Jolla Symphony and Chorus and the San Francisco Contemporary Music Players. As a conductor, he has appeared with the BBC Scottish Symphony Orchestra, the Saint Paul Chamber Orchestra, the Milwaukee Symphony, Ensemble Modern, the International Contemporary Ensemble, and the Asko/Schönberg Ensemble. He is the curator of, and will be conductor and percussion soloist in, “It’s About Time,” a festival of the San Diego Symphony to be held in January of 2018. Schick’s publications include a book, “The Percussionist’s Art: Same Bed, Different Dreams,” and many articles. He has released numerous recordings including the 2010 “Percussion Works of Iannis Xenakis,” and its companion, “The Complete Early Percussion Works of Karlheinz Stockhausen” in 2014 (both on Mode). He received the “Diapason d’Or” as conductor (Xenakis Ensemble Music with ICE) and the Deutscheschallplattenkritikpreis, as percussionist (Stockhausen), each for the best new music release of 2015. He was inducted into the Percussive Arts Society Hall of Fame in 2014. Steven Schick is Distinguished Professor of Music and holds the Reed Family Presidential Chair at the University of California, San Diego. Starting in 2017, he is co-artistic director, with Claire Chase, of the Summer Music Program at the Banff Centre. This year, he will become the Artistic Director of the Breckenridge Music Festival.